Since no human being witnessed the creation of the Earth, we can only estimate its age by using various natural "clocks" and some assumptions. All of these "clocks" have common characteristics that we can illustrate by considering the simple example of the familiar hourglass. An hourglass has two closed chambers connected by a narrow passage and a quantity of sand that gradually trickles from the top to the bottom chamber. We can tell how long the hourglass has been running if we measure the sand in both chambers, measure the trickle rate, assume the starting conditions (how much sand was in each chamber), assume that no sand was added or subtracted, and assume that the trickle rate has not changed. Now, when we apply this hourglass analogy to methods for dating the age of the Earth, we will see that any of the assumptions may have been violated, rendering the apparent age estimate incorrect. This increases the importance of using all available methods and considering all observations. Let's look at the main "clock" used by Evolutionists to estimate the age of the Earth: radiometric dating of granite or basalt. The term radiometric means that the natural process of radioactive decay7 is used to measure apparent age. Radioactivity is a natural process that changes a radioactive "parent" atom into a non-radioactive "daughter" atom. As a PhD in nuclear physics, I would love to explain all the intricate details of radiometric dating, but we don't actually have to look very deep to find the problems that invalidate this favorite technique. Although there are more than a half-dozen radiometric clocks in use, one example is enough to illustrate the method: the uranium-lead clock. Tiny crystals of zircon that are found in granite are assumed to naturally contain some uranium atoms when they are formed, but it is assumed that they start with no lead atoms. It is assumed that zircon crystals are impervious to addition or subtraction of uranium or lead, and it is assumed that the rate uranium changes into lead has always been constant. 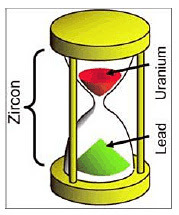 The hourglass analogy illustration shows uranium (red sand) in the top chamber and lead (green sand) in the bottom chamber. Half of the original uranium would have changed into lead in 4.5 billion years. If all the assumptions were true, then measuring precisely how many atoms of uranium and lead are in a zircon sample would yield a reliable estimate of the age of the sample. Many samples are measured and the results are then sifted. If the apparent age is younger than expected (a "wrong" answer), then the sample result is labeled "contaminated." Only those samples that give the expected result (a "right" answer) are presumed to be "uncontaminated" and reliable. You can see the circular reasoning and data-selection bias at work. Initial Conditions Assumption is Wrong: There are serious problems with the assumptions of initial conditions and constant change rate. Dating has been attempted on basalt rocks of known age formed from volcanic lava produced in recent history. If the dating method assumptions about initial conditions were correct, the apparent age of these newly formed rocks would be zero. But instead, examples from Hawaii, Mount St. Helens, and New Zealand have yielded apparent ages up to 3.5 million years.8 The radiometric method gives blatantly wrong answers on rocks of known age, so why should we believe the (highly selected) results reported for rocks of unknown age? Radioactive Rate has Changed: Under most circumstances, radioactive change rates are constant and are not affected by the environment (heat, pressure, etc.). However, in a nuclear reactor the rates are greatly speeded up. We have found direct evidence of a natural reactor9 in Gabon, Africa. A "natural reactor" is a location where a heavy concentration of uranium exists, making the uranium-lead clock run very fast and thus giving the appearance of great age. If this natural reactor is later melted into magma and then becomes granite or basalt, then the apparent age of the rock formations would be billions of years, when, in fact, they are only thousands of years old. It is likely that such natural reactors were common and fed the magma released during the worldwide flood of Noah.10 Thus we would expect the appearance of great ages to be measured by radiometric methods. In the last part of this series "Our Young Earth," we'll continue to look at the inherent problems with radiometric dating and delve into the Bible to learn what Jesus taught concerning the age of the Earth. 7) Wikipedia, "Radioactive Decay," http://en.wikipedia.org/wiki/Radioactive_decay. It is actually the nucleus of the atom, made up of protons and neutrons, that decays by radioactivity. 8) Mike Riddle, "Does Radiometric Dating Prove the Earth Is Old?" www.answersingenesis.org/articles/nab/does-radiometric-dating-prove. 9) Wikipedia, "Natural nuclear fission reactor," http://en.wikipedia.org/wiki/Natural_reactor. 10) Genesis 7:11 (NKJV): "...on that day all the fountains of the great deep were broken up, and the windows of heaven were opened." Is it possible for the Earth to be billions of years old and man to have survived it all? Or is the accounts of Abraham, Noah part of the truth of how old earth is?